. 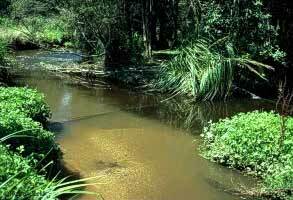 : Farm Forest Line - Water Quality in Waterways and Streams :. Water quality is reduced by salt, sediments, nutrients and suspended organic matter, and in some cases, chemical pollutants. Organic and clay sediments not only affect the appearance of water but also carry nutrients, particularly phosphorous, and microorganisms. Although also absorbed into sediments, the bulk of the nitrogen in waterways is transported as soluble nitrates. Phosphorous and nitrogen are responsible for algal blooms in dams and waterways. The potential for trees and shrubs to improve water quality of farm dams and reduce the discharge of nutrients from farms into waterways and groundwater depends largely on the source of nutrients and their pathways. The first distinction is between point and diffuse sources. Point sources of nutrients are those areas where high concentrations of nutrients enter the groundwater or waterways, affecting water quality. These are usually identified as septic tanks, dairies, refuse areas etc. Diffuse sources of nutrients are those areas where low concentrations of nutrients enter the groundwater or waterways from sources other than those recognised as point sources. Nutrients are continually leached from pasture and crop lands, particularly where soluble fertilisers are used or grazing stocking rates are high, especially where stock have access to the waterways. Soil erosion is the main culprit, as it not only removes the soil, but also the nutrients attached to the soil particles.